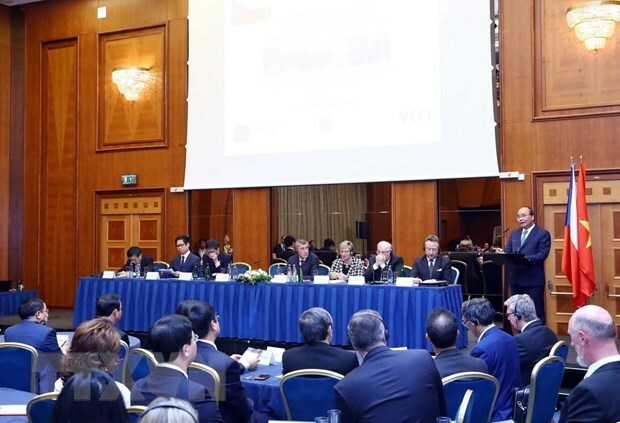 Prague (VNA) – The Czech Republic-Vietnam Business Forum was held in Prague on April 17 within the framework of Prime Minister Nguyen Xuan Phuc’s ongoing visit to the European country, drawing representatives of more than 100 enterprises and investors of both sides. Addressing the event, Jaroslav Hanak, President of the Czech Confederation of Industry and Transport, said that the country holds strengths in industry, science, and technology, and is willing to partner with Vietnam in these fields. Czech Minister of Industry and Trade Marta Novakova highlighted the cooperation potential between the two sides in education-training, underlining the role of Vietnamese alumni who studied in the Czech Republic as bridges between the two peoples. She lauded the position and prestige of Vietnam in the region and the world, stating that the Czech Republic supports the EU’s signing of the free trade agreement with Vietnam (EVFTA) and the EU-Vietnam Investment Protection Agreement (EVIPA). She also suggested a number cooperation areas that the Czech Republic has advantages in, such as the automobile industry and crystal production, while expressing hopes to increase exports to Vietnam. At the event, Czech Prime Minister Andrej Babis underscored the contributions by the Vietnamese community to socio-economic development in the European country and the growth of bilateral partnership. He expressed his delight at the expanding bilateral relationship, adding that he hopes the EVFTA will be signed before the upcoming European Council election, thus opening up more chances for EU and Czech Republic enterprises to soon increase trade and investment partnerships with Vietnam. The Czech PM proposed that business communities of both sides strengthen import-export activities between the two countries, affirming that the two governments will create optimal conditions for the launching of a direct air route linking Hanoi and Prague in 2019. He said that leaders of the two countries discussed the simplification of procedures for granting visas for citizens of both sides to visit each other’s countries. He stressed that Vietnam is a huge and promising market for Czech firms to invest in and operate production activities. For his part, Prime Minister Nguyen Xuan Phuc said he hopes that after the forum, businesses of both sides will continue maintaining their connectivity and meetings to seek partnership opportunities. He added that Vietnamese and Czech firms should further promote partnership in broader areas, pledging that the two governments will back them in the work. Noting that Vietnam and the Czech Republic’s economies are more supplementary than competitive, the Vietnamese Government leader held that the bilateral partnership will grow with greater efficiency in the future. He said that Vietnam has political and social stability, strong tropical agriculture, and a rapidly growing processing-manufacturing sector with wide export markets, adding that the local business environment has been much improved, drawing nearly 28,000 FDI projects with a total capital of over 345 billion USD. Vietnam ranked 77th out of the 137 countries on the global competitiveness index in 2018. In early April of 2019, S&P Global raised the country’s sovereign rating to BB with a stable outlook. So far, Vietnam has signed and implemented 12 FTAs, including the Comprehensive and Progressive Agreement for Trans-Pacific Partnership, said the PM, adding that Vietnam is working with the EU to speed up the signing and ratification of the EVFTA, which is an important foundation for the promotion of trade ties between Vietnam and the EU, including the Czech Republic.